Soltau is a mid-sized town in the Lüneburg Heath in the district of Heidekreis, in Lower Saxony, Germany.Coat of armsThe coat of arms of Soltau shows the lion of the Welf dynasty behind a red city gate. 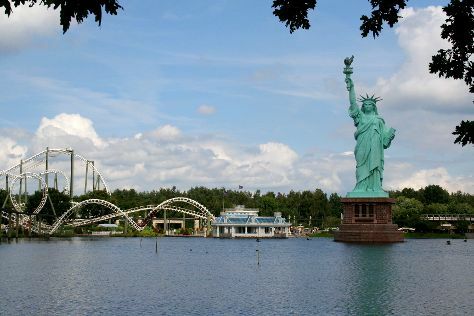 Kick off your visit on the 26th (Thu): get in on the family fun at Heide Park Resort. On the next day, take in the architecture and atmosphere at Stadtkirche, pause for some photo ops at Bergen-Belsen Memorial, and then tour the pleasant surroundings at Weltvogelpark Walsrode. To get reviews, maps, traveler tips and more tourist information, use: Soltau travel guide. Use the Route module to find suitable travel options from Szczecin, Poland to Soltau. When traveling from Szczecin in May, plan for slightly colder days in Soltau--highs around 19°C--while nights are about the same with lows around 8°C. Wrap up your sightseeing on the 27th (Fri) to allow time to travel back home.